Our family has proudly cultivated a reputation as leaders in North Carolina agriculture since before the Great Depression. Past generations of Boyettes have helped shape the company we are today. Unlike other farms that continue to operate under a family name long after descendants have moved on, our farm truly is a family farm. 1920s - Guy Boyette began the North Carolina family farm legacy in a small community known as Rock Ridge. The Boyette family has farmed in Wilson County, North Carolina ever since. 1950s – Guy's son, Armetus, joins him in operating the family farm in Rock Ridge. 1970s – Armetus continues the farm with his sons Wiley, Robert and Michael once the three brothers finish school. 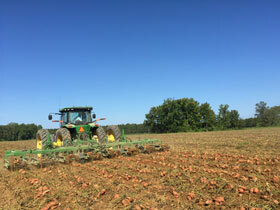 1982 - In an effort to diversify Rock Ridge Farm and take advantage of the exceptional soil, the Boyette brothers optimistically begin growing sweet potato crops. Many farmers would later consider this year as one of the worst years for sweet potatoes, due to its significantly low market value. 1983 - Rather than replace the crop with a more profitable one after the first year, the brothers take a leap of faith and plant sweet potatoes again, despite an unpredictable outcome. They made the decisions with an eye for long-term growth instead of temporary trends. As Armetus said, "The only way the price can go is up from here." 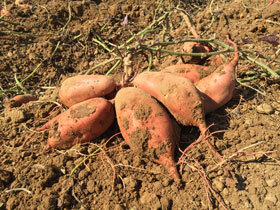 1990s – Sweet potatoes become a major point of focus as operations continue to expand. 1996 – Armetus passes away in November 1996, leaving the three brothers more determined than ever to carry on the family business. 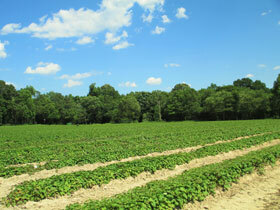 2011 – The brothers make a strategic business decision to make sweet potatoes the #1 focus. 2012 – Farm acquires organic certification after transitioning away from chemical pesticides and turning over to more environmentally-friendly farm practices. Over the winter, the Boyette brothers decide to open a sweet potato packing house. The spaces takes less than a year to build. Boyette Brothers Produce officially opens to expand distribution to a growing market. 2013 – Boyette Brothers Produce exports to England for the first time, sparking a new foreign export arm that begins to attract more countries. 2017 – An organic packing line prepares to open by year's end. New packaging is released for the farm's traditionally-grown (Top of the Rock) and organically-grown (Organic Sweet Supreme) produce. 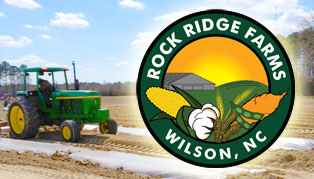 Today, Rock Ridge Farms grows over 1,000 acres of Covington sweet potatoes, a portion of which are certified organic, as well as 6,000 acres of cotton, soybeans, corn, wheat and peanuts. Each year our acreage grows. 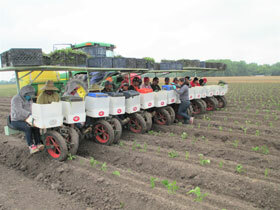 Strong ties to neighboring family-owned sweet potato farms provide additional acres. We also offer other premium varieties to suit virtually any buyer's needs. Offering a year-round supply, our services cross international borders with the majority of our supply going to the United Kingdom and other parts of Europe. The succession plan envisioned by the brothers has followed suit with fourth generation family members, including Robert's daughter Regan, working together in the family business. Contact our produce sales team for the latest growing schedule.